So I'll now ask everyone to consider the odds of these 4 cameras capturing a sequential series of shots showing 'FLIGHT 175' entering and exiting their given lens views in seamless fashion. Does this seem likely - or can you say "fabricated animation sequence"? I call this the "16-second magic sequence". You will have to be very convincing if you are to tell people that this was all a matter of pure happenstance. Please know that these mere 16 seconds of 'plane footage' make up THE GRAND TOTAL OF AIRPLANE IMAGERY THAT THE TV NETWORKS SHOWED LIVE ON 9/11. 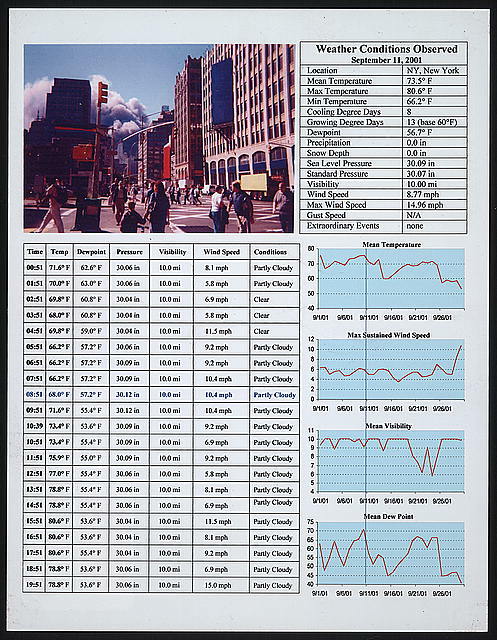 This the sum total of shots of alleged "FLIGHT175" shown on LIVE TV ON 9/11. Four sequential chunks of 'the hijacked airliner's' approach were aired in seamless succession, none of the 4 'camera shots' overlapping the other. - How did the producers of CBS, NBC an ABC coordinate their respective cameramen so that - at no time - no two of them filmed the 'aircraft' at the same instants in time/space? - If you assert that this was just a happenstance/coincidence, please provide (on a scale from 1million to 10trillions) a calculation of the statistical probabilities for this occurence. 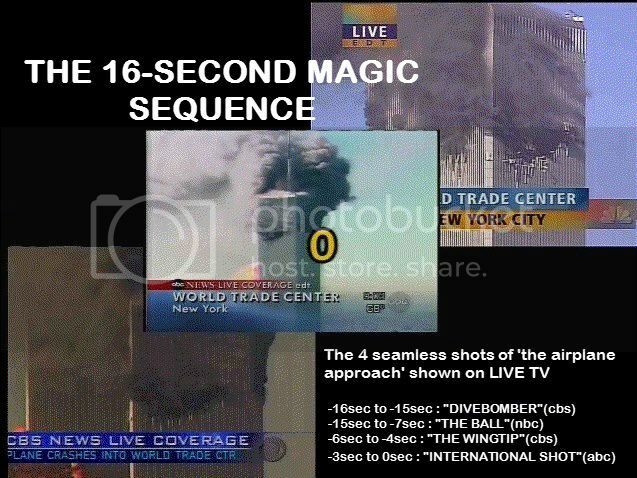 - Considering the 3 TV feeds are accurately synchronized (+/- 0,2secs) why does CBS show WTC2 exploding at least 1 second before ABC? THE DOUBLE-BEEP AUDIO SIGNAL HEARD ON LIVE TV. Any ornithologists / birdwatchers out there ? Would you please watch this video and tell us what birds fly in flocks over Manhattan, capable of accelerating in close formation (all at once) by a factor of 44% in a split second? Last edited by Equinox on Thu Nov 08, 2012 8:59 pm, edited 2 times in total.
" 9/11 JUMPERS ARCHIVE. " 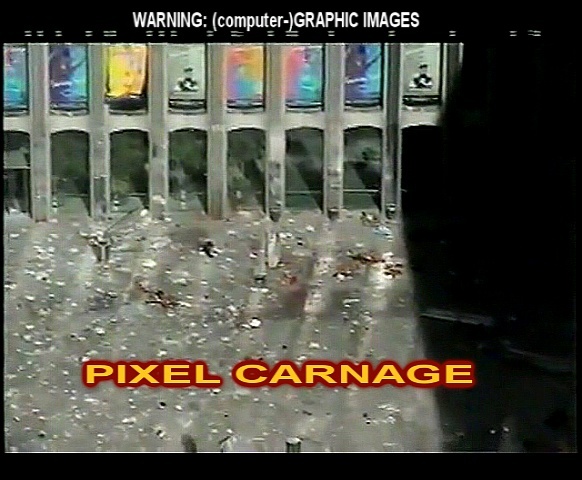 Archive- Raw 9/11 Footage from Hilton Hotel Window. 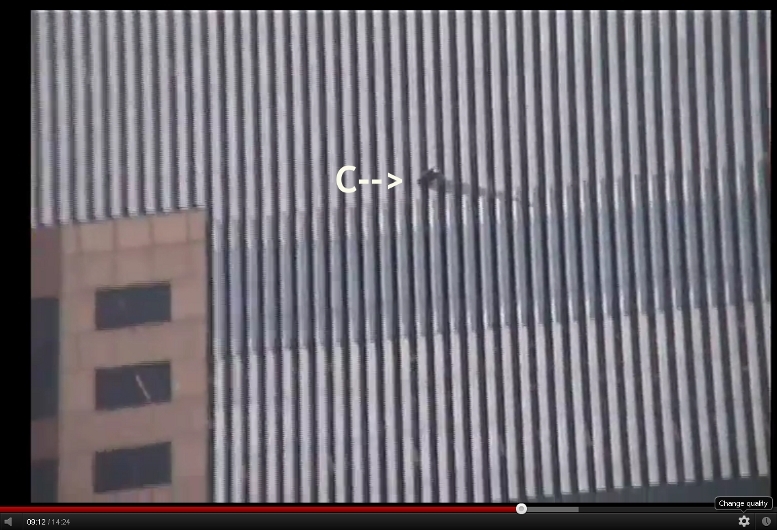 Let's have a look at what this " World Trade Centre JUMPERS" video is all about. As you may imagine, it's about people jumping from the World Trade Centre buildings - right? Ok. So let's see if this video is real - or if it's simply yet another 3D animation.
. 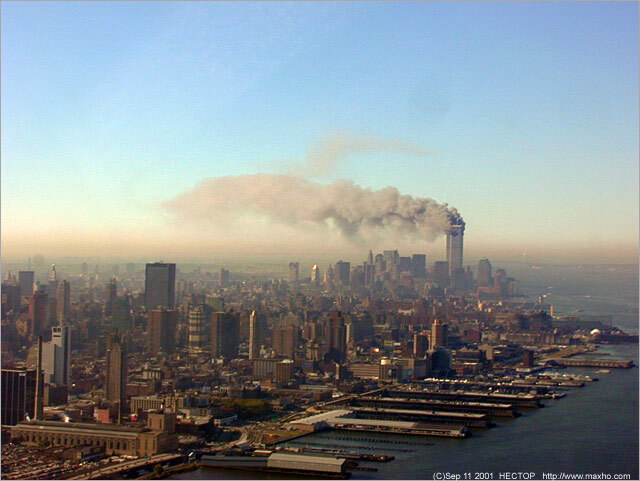 It shows WTC2 burning before it "was hit by an airplane... Well, that is just absurd. 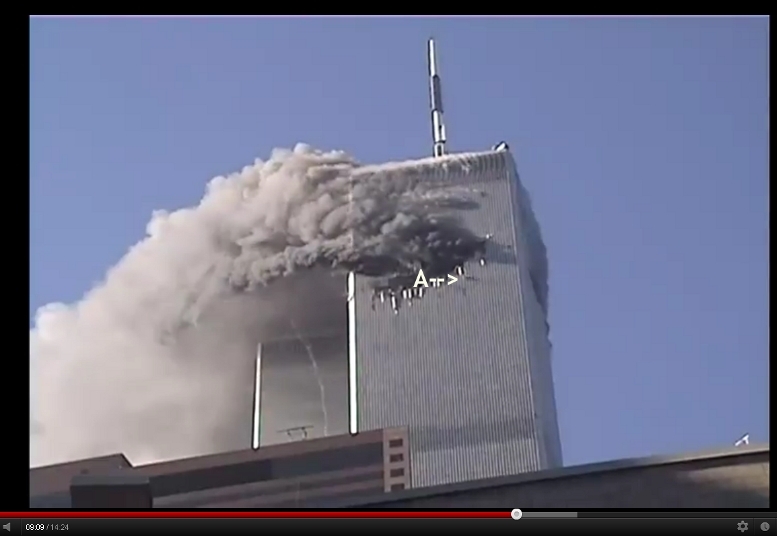 We never saw WTC2 on fire BEFORE it was supposedly struck by a Seven six Seven commercial airliner! It's almost hilariously bad image forgery - even Steven Spielberg would disapprove! It is defiantly not a window reflection. Last edited by Equinox on Sat Dec 29, 2012 1:23 am, edited 1 time in total. 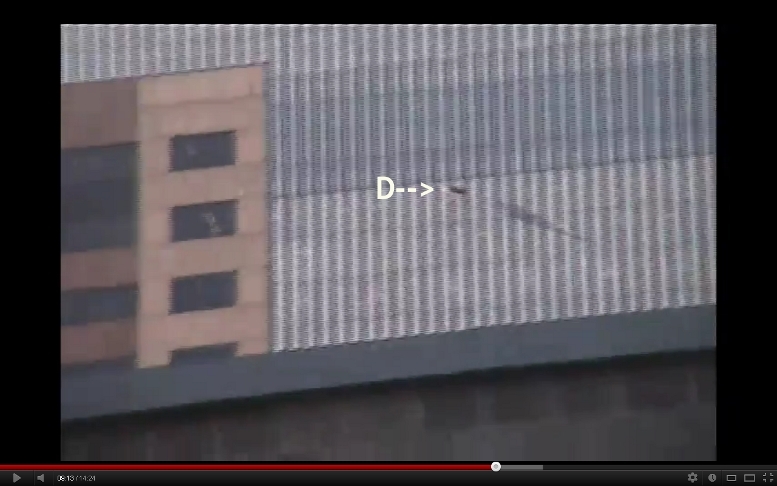 The best part of the infamous"Jim Huibregtse's" clip is when it shows a supposed 'suicide jumper' (which we shall call "ISAAC") tumbling down the WTC façade - causing poor Sir Isaac Newton to, once again, spin in his grave. ISAAC's trajectory can be traced in three easy steps: A - B - C.
And here is "D" - the cherry on the cake: ISAAC's shadow separates from his body and goes its own way! THERE IS ZERO REALITY in these 9/11 computer animations. They are quite horrid digital contraptions. All of them. I rest my case. I would really like to hear anyone challenging this finding. Can a shadow suddenly detach from an object - in the real world? I will be patiently waiting for anyone wishing to explain what we see in the above "jumper" imagery. Until then, I will rest my case: ALL of these 9/11 images are phony, digital contraptions. GAME OVER! concentrate on what you do best (a most appreciated support as far as I'm concerned): the archiving of the SC source material - a time-consuming endeavor that you have shown to be willing and able to help us out with. 9.00 am Friday Perth time here mate. Lets see how much I can get archived over the next 72 hours.. I will transfer it over to the archive section as well. ABC7 and Peter Strid Clones. Here is another example showing that both the alleged "amateur" imagery and the TV imagery was crafted by the SAME FILM / ANIMATION STUDIO. Below, I compare a shot credited to one "Yuri Faktorovich", who allegedly flew by Manhattan around 9AM that morning. Now, think about it: what are the odds/possibilities that Yuri captured (through his Cessna window) a shot which looks extremely similar - in every respect - to the (alleged) NBC4 TV chopper, with its high-end camera equipment? NBC Markers flashing inexplicably directly before “The Ball” downward trajectory towards the final impact.